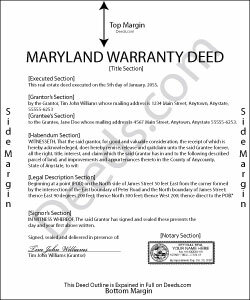 A general warranty deed under Md. Code, Real Property, 2-105 is a legal document used to transfer, or convey, rights in real property from a grantor (seller) to a grantee (buyer). This type of deed offers the highest level of protection for the grantee. When using a general warranty deed, the grantor warrants that they are the true owner of the property and have the legal right to convey it, and that the property is free of liens or encumbrances unless otherwise listed in the deed . Warranty deeds require statutory language that the grantor "will warrant generally the property hereby granted," meaning that the grantor will defend the grantee against every lawful claim and demand of any person against the title (Md. Code, Real Property, 2-105). A lawful general warranty deed identifies the name, address, and marital status of each grantor and grantee. State law requires that all recorded documents contain information on how the grantee will hold title. For Maryland residential property, the primary methods for holding title are tenancy in common, joint tenancy, and tenancy by the entirety. A grant of ownership of real estate to two or more unmarried persons is presumed to create a tenancy in common, unless expressly stated otherwise (Md. Code, Real Prop. 2-117). In the case of a married couple, a tenancy by the entirety is automatically created (Md. Code, Real Prop. 4-108). Give the source of title, a complete legal description of the property (Md. Code, Real Prop. 4--101), and a certificate of preparation (Md. Code, Real Prop. 3-104(f)(1)) in the deed. General warranty deeds must be accompanied by a completed intake sheet when submitting for recordation (Md. Code, Real Prop. 3-104). Other required documents may include an affidavit of residency, and/or Maryland Form MW 506 NRS for non-resident sale of property. Contact the local recording office with questions about supporting materials. A transfer tax is imposed on most deeds (Md. Code, Tax Prop. 13-202). Find exemptions from the transfer tax at Md. Code, Tax-Prop. 13-207(a). As a prerequisite to recording, general warranty deeds must be endorsed with the certificate of the collector of taxes of the county where the property is assessed. General warranty deeds must be signed by the grantor in the presence of a notary public. Witnesses are not required for conveyances of real estate in Maryland. In addition to the content requirements set forth by statute, the form must meet all state and local standards for recorded documents. These may vary from county to county, so contact the local recording office with questions. Record the executed deed in the circuit court for county where the property is located in order to provide notice of the transfer. If the subject land is in more than one county, record the deed (or a certified copy) in all such counties (Md. Code, Real Prop. 3-103). This article is provided for informational purposes only and is not a substitute for legal advice. Contact a lawyer with questions about general warranty deeds or transfers of real property in Maryland.